The early space age is marked by Soviet accomplishments — the first satellites, the first living being launched into orbit, and the first human in space to name just a few. But there was one very important technological first secured by the United States in 1960. America was the first nation to safely recover a payload from orbit. When we think about the early space age and history’s first satellites, we think about launches. Launching into orbit was the exciting technology behind Sputnik that promised a future where men could travel beyond Earth orbit. Those early satellites weren’t designed to be recovered. Sputnik’s orbit decayed and it fell to Earth in January of 1958. But it didn’t matter; it was the launch that was historically more important. That was until satellites started being put to use as reconnaissance platforms — then recovering the satellites’ payload took center stage. In the United States, the idea to use satellites as reconnaissance platforms came in the wake of the U-2’s first flight over the Soviet Union in 1956. Developed under a strict curtain of secrecy, the high-flying photo reconnaissance plane was detected as soon as it crossed into Soviet airspace. America had lost the element of surprise, and it was thought to be a matter of time before the Soviets found a way to shoot down the U-2 (which, of course, they did in 1960). The United States needed a less vulnerable photo reconnaissance platform, and orbiting satellites were the obvious answer. The program that developed from this need was called Corona, and the first family of satellites was called Discoverer. Getting the satellite into orbit at that point was the easier part. Getting the pictures back was a different matter. The obvious answer was to have the pictures sent back via telemetry to a receiving station on Earth. The problem was that this method wasn’t secure enough for material as sensitive as reconnaissance photos. The best answer was to manually recover the film and develop it at a secure location, and this led to a complicated recovery method: mid-air recovery. Timing was everything, but if the mid-air recovery did fail there was a backup method. The canister was designed to float just long enough for an attempted helicopter recovery. Then it would sink in an attempt to keep the film out of enemy hands. Between parachute problems and personnel inexperience, the mid-air recovery method proved to be a difficult one. The first phase of testing used personnel-type parachutes, and just 49 of the 74 dropped canisters were recovered. When testing switched to operational parachutes, only four out of 15 canisters were successfully snagged. Trial and error led to changes of the parachute. In the end, a chute was developed that would slow the film canister’s fall enough that an airplane would be able to make five attempted recoveries before leaving it to fall into the ocean. The Corona program got off to a rocky start in 1959 with nothing but failures in the first year of launch attempts. Then, in August of 1960, the program found success. Discoverer 13 launched on Aug. 10, 1960, and it was a success almost to the end. The film canister landed far out of its designated recovery zone and was fished out of the ocean before it sank. But eight days later Discoverer 14 launched, and this mission went off beautifully. The satellite reached orbit and its camera came to life. It snapped away, imaging areas of the Soviet Union no American had seen to that point before transferring the film to the recovery canister. The canister reentered the atmosphere, the heat shield fell away, and the parachutes deployed, first a drogue then the main. In the target recovery zone, Captain Harold E. Mitchell of the 6593rd Test Squadron was waiting. Once he spotted the canister he flew towards it and snagged its parachute with the hook hanging below his C-119. He pulled the film into the aircraft and delivered to a secure location where it was processed and studied. Discoverer 13 had been successfully recovered, but Discoverer 14 marked the first time an orbital recovery method had worked perfectly. In a little over a week, the United States managed history’s first two successful payload recoveries from space. But it wasn’t long before the Soviets caught up. On August 19, 1960, the Soviet Union launched Korabl-Sputnik 2 with the dogs Belka and Srtrelka on board along with 40 mice, two rats, and a small variety of plants. The spacecraft reached orbit and remained aloft for a day before its orbit decayed. It reentered the atmosphere and landed in the designated recovery zone the following day. It wasn’t snagged in mid air, but the capsule was recovered like it was designed to be. Both dogs survived their brief spaceflight. Strelka went on to have a healthy litter of puppies. 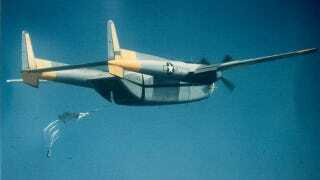 Image: A declassified photo of a C-119 training for the aerial recovery of a Corona film bucket in 1960. Credit: NRO.